"MP 2" redirects here. For information about the sequel to Mario's Picross, see Picross 2. Mario Party 2 is the second installment in the Mario Party series for the Nintendo 64. Mario and the gang are fighting for the rights for a new amusement park. The objective is simple and similar to the previous Mario Party: obtain stars and defeat Bowser. This game introduces the first use of collectible items in Mario Party's history; the first game had items, but they simply added optional rules or game modes to the game. Each board has its own tricks and turns, and the playable characters, as well as Bowser, wear different outfits based on the theme of the board. Battle, Item, and Duel minigames are introduced in Mario Party 2. Battle Minigames give every player a chance to win 70% of the stocked jackpot taken from players (usually a set amount). The top two get a 70/30 share, while the bottom two get nothing; a leftover coin is given randomly. Additionally, players can no longer lose coins in normal minigames. Also, the players now have the option to practice minigames, which would later be featured in all future installments. Mario Party 2 is the first Mario Party game released on the Virtual Console, first released on the Wii's Virtual Console in Japan on November 2, 2010, and later released on the Wii U Virtual Console. It is currently the only home console Mario Party game to be available through Virtual Console. The cast argues over what to call their new land. The game opens on a stage where Toad comes out to welcome guests and introduce the story of the play. Alas, but Wario stepped forth and said, "This world should be named for a Super Star, instead. Wario Land is a far better name!" And so they all argued the depth of their fame, "Peach Land is better!" And "My name is best!" Toad could not believe the words of the rest! But as they debated who was more grand Bowser invaded that Mario Land!!! "There's no time to argue and no time to fight! "The task is before us," Toad said with a fright, "This land shall be named for the Super Star who defeats evil Bowser and saves us all, too!" So Mario and friends took on this new quest, to defeat the King Koopa and prove who's the best! They went deep into space, met ghosts and pirates, but always on Bowser their keen sights were set. No adventure more trying, no reward more grand... So speaks the legend of Mario Land! One day Mario and friends (save for Wario) decide to create a new world. They name this new world Mario Land. But Wario is unhappy with that name, and introduces his own name; Wario Land. Thanks to Wario, an argument breaks out on what to call this new world. Peach suddenly interrupts the group claiming she has a name they can all agree on. 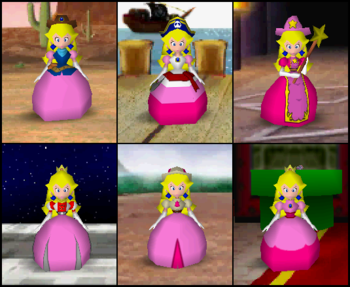 She reveals her name to be Peach Land and the characters double over in irony. As the group continues to argue, a sinister event is taking place on the other side of the unnamed world. Bowser has set his sights on this new land, and quickly begins invading it for himself because the group is still arguing. A lone Koopa Troopa sees his invasion and then arrives to warn the group about Bowser's plans. However, since they are fighting they do not hear him. Toad then gets everyone's attention by saying whoever can beat Bowser will have the new land named after them. The cast quickly runs off to defeat Bowser and claim their prize. The story then takes the characters across six lands ending in Bowser Land. Bowser meets the group in a showdown showing his Metal Bowser power up and claims he is invincible. The character (depending on who won the board) then fights Bowser and with the power of the stars, is able to throw him into orbit. The game then resumes to the stage format with Mario and friends triumphantly standing over a defeated Bowser. Toad exclaims that they live in peace in the new Mario Land (which does not change depending on the character). The curtain falls and each character comes out for one final bow, followed by the whole cast. Mario Party 2 features six playable characters, the same amount as its predecessor. 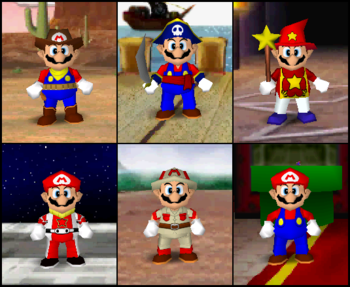 This is the only Mario Party game where characters dress according to the theme of the board. Items can be bought at item shops. The offer of the shop varies with the number of turns played and the current rank of the player. Items are also procured by playing item minigames. Bowser Suit When used, the player using it will masquerade themselves as Bowser. The masqueraded player will then roll the Dice Block, and any players whom are passed will have to give twenty Coins to the masqueraded player. 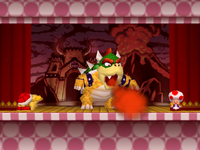 Bowser Bomb When a player obtains this item in an item minigame, Bowser will use it at the end of the current turn. When used, Koopa Kid will transform into Bowser. Bowser will then roll three Dice Blocks, and will move accordingly. Any player that Bowser passes will lose all of their Coins. This is Donkey Kong's favorite item. A player can only hold one item at a time here. In future installments, more items can be held, usually 3. In Bowser Land, there is a shop run by Koopa Kid, who will force the player who passed in front of it to buy an item on his choice at a higher price. It can be Mushroom for 12 coins, Skeleton Key for 12 coins, Warp Block for 17 coins, or Bowser Suit and Bowser Bomb (which are usually unobtainable via shopping) for 12 coins each. 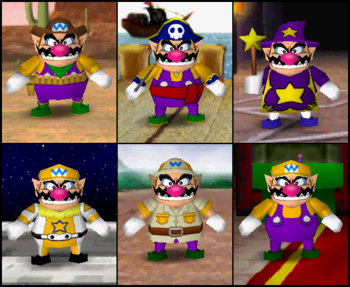 Some of Mario Party 2's boards reference the original game's boards; for example, Mystery Land uses the gimmick that Wario's Battle Canyon has, and Horror Land uses the gimmick first seen in DK's Jungle Adventure. Also, Horror Land's main gimmick, the day-and-night system, would later become the foundation of Mario Party 6. Pirate Land Pirate Land is the first board of Mario Party 2. The players are dressed in a pirate garb, and they are assigned the title "Captain." If a player lands on one of the Blue Spaces that is on a dock, Sushi the shark will appear. Sushi will then take the player to another dock on the board. The Happening Spaces cause a cannon to shoot a cannonball at the player, sending them back to the starting space. There are a few short-cuts on this board, all guarded by Thwomps. For players to pass a Thwomp, they must pay a fee of one Coin. The fee will then increase by one Coin. Western Land Western Land is the second board of Mario Party 2. Players are dressed as cowboys and have "Deputy" as their title. The main gimmick of this board is Steamer, who runs along the perimeter of the board. Players who want to ride Steamer have to pay a fee of five Coins at a toll. While riding Steamer, the player riding Steamer will hit a block, assigning what direction Steamer should move - either forward or backward. Steamer will move on his own if a player lands on a Happening Space. Any player hit by Steamer will be sent back to the starting space. There is also a milk shop run by Wiggler. When a player passes it, it will ask if the player wants to have a hootenany for 20 Coins. Accepting the offer brings every other character to the shop for a hootenanny. Space Land Space Land is the third board of Mario Party 2. Players are dressed as astronauts, and are members of the Space Patrol. The main unique feature of this board is the Bowser-faced junction in the very middle of the board. Every time the junction is passed, the number showing will decrease by one. When it reaches zero, Bowser will fire a laser beam at the diagonal pathway that starts at the north-east corner of the map, and ends at the south-west corner of the map. Every player blasted by the beam will lose all of their Coins. The Happening Spaces make a Whomp and a Thwomp chase the player who lands on the space to the other side of the map. Any other player caught by the Whomp and the Thwomp will also be chased to the other side of the map. If a player passes by the Snifit Patrol, they will ask whether the player wants them to set up a speed trap on the board. Should the player accept this, the player has to pay a toll of five Coins. While the speed trap is active, the Whomp and Thwomp will be caught by Snifits, further sending away the chased players. Mystery Land Mystery Land is the fourth board in Mario Party 2. Players are dressed as archeologists, but are not given a title. The main feature of this board is the four islands that make up the board. For players to move from one island to another, they must land on a Happening Space. This will take any player who landed on the Happening Space to the next island in a clockwise manner. The other way for players to access other islands is for the player to pay a Bob-omb ten Coins. Another feature of this board is Shy Guy's Curse House, which - when players pass - they can pay five Coins to make the Shy Guy put a curse on the player that the player passing chooses. The curse includes making the selected player only be able to roll from one to three on their next turn. Horror Land Horror Land is the fifth board in Mario Party 2. Players are dressed as wizards and are assigned the title "Wizard." The main unique feature of this board is the day and night mechanic. The time of day will change every two turns, or whenever players land on Happening Spaces. Players may also change time from day to night only if they pass by the "Mystery Mansion" on the northern corner of the board where they will be greeted by Kamek. Kamek will then ask the player to pay a fee consisting of ten Coins. Should they accept this, the time of day will change to night-time. During the night, if players pass by the dancing floor they are greeted by a few Boos and a Mr. I. For a fee of twenty Coins, they will dance to make it day-time. If players pass by Mr. I, he will ask them to pay a fee of either ten Coins during the day, or five Coins during the night. Should they accept this, they will be taken to the north-west corner of the board. Another feature in this board is the Whomps. When passed by, they will change their position. During the night, they will not be able to move. Another feature is the Big Boo on the north-east corner of the board. Should players pass by him during the night, he will ask the player passing to pay three times the usual fee. Unlike normal Boos, he will steal from all players at once. Bowser Land Bowser Land is the sixth and final board in Mario Party 2. This board is unlocked when all the other boards have been played at least once. Players are not dressed in any costumes beside their normal attire, and they are not assigned a title. The rules of the game are turned around on this board. The effect this has is that, when a player passes by a bank, they gain five Coins instead of having to pay the equivalent sum of Coins. This will add up to a loan in the bank. Also, unlike in other boards (where any player who lands on a Bank Space will receive all previously deposited Coins), they will have to pay the full loan (or less, if they do not have enough; if they have no Coins, they will lose a Star). There is also an item shop where the owner, Baby Bowser, will force the player passing to buy an item he selects. While these features are prevalent, the main feature of this board is the Bowser Parade. After each five turns, the parade will start. Any player caught in the parade will lose two Coins per space, and they will eventually be sent back to the starting space. However, if no players are in the parade's path, the parade will be canceled. For players to control the path the parade will take, they can manipulate tiles with arrows on them. They can change the direction of the tiles by passing a Baby Bowser and paying him a fee of five Coins. The Happening Spaces near a red Warp Pipe make players warp to the next red Warp Pipe. Players who land on a Happening Space near the Blooper at the north-west corner of the board will be taken to a "ride," where they will go in a circle until they manage to land on another Happening Space. Here players can buy minigames from Woody to play them. They can play freely or in the Mini-Game Stadium. The player can also participate in the Mini-Game Coaster, which can unlock Item and Battle minigames in the Free Play mode. Exclusive to the PAL version is a language select, which allows the game to be played in British English, European French, German, Italian or Castilian Spanish. The screen first appears when turning on the game for the first time. can be held down before turning on the console to force the screen to appear after the first time. The Japanese ending of Western Land includes the player and Bowser battling with revolvers. In the international version, Nintendo replaced the revolvers with toy guns instead. This is most likely due to the concern of parents in the Western world. Super Mario Bros.: Part of the track "Couldn't Be Better" uses part of the theme song from this game. Super Mario Bros. 3: The jingle that plays when a single player completes a minigame is an arrangement of this game's Stage Clear theme. In addition, similar to that game, the premise of the plot is implied to be a stage production. Wario Land: Super Mario Land 3 / Virtual Boy Wario Land: In Mystery Land, Wario wears a pith helmet just like he does in those games. Mario's Picross: In Mystery Land, Mario wears an archaeologist outfit just like he does in this game. Super Mario 64: Part of the track "The Blue Skies Yonder" uses the first few notes of "Slider" from this game. Also, in the ending scene for the Bowser Land map, Bowser becomes metallic as if he obtained a Metal Cap and the character in first place, after being powered up by the Power Stars, defeats Bowser the same way as when he is fought in this game. Mario Kart 64: The voice clips for Luigi, Peach, Toad, and Wario are reused from the Japanese version of this game. Mario Party: Many aspects of this game are re-used, such as certain minigames and the characters' voice clips. Additionally, a lot of the songs are remixes of music from this game. 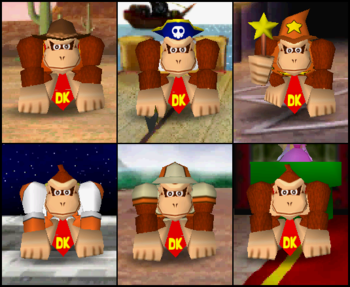 Mario Party 3: The character mugshots of Mario, Luigi, Peach, Yoshi, Wario and Donkey Kong were reused for this game. Super Smash Bros. Brawl: Yoshi in his Pirate Land costume appears as a collectible Sticker. Super Mario Odyssey: After beating the game, Peach wears her Archaeologist outfit in some areas of the game and is one of the random outfits Peach wears after Mario puts his hat on top of Peach's castle after getting 999 Power Moons. To a lesser extent, Mario's Explorer outfit and cap bears a resemblance to his Archaeologist outfit from this game. Mario Party: The Top 100: Thirteen minigames from Mario Party 2 return in this game, along with four others in their original Mario Party format. 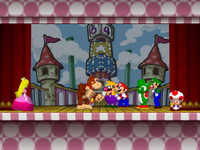 For this subject's image gallery, see Gallery:Mario Party 2. Sarcastic message sent by Nintendo of America to Game Informer over their review of the game. Mario Party 2 received mostly positive reviews from critics. It was praised for its additions to the original game's foundation and generally considered a moderate improvement. This praise, however was somewhat offset by the unchanged formula from the first game - in particular, the somewhat important factor of luck and lack of enjoyment playing alone. GameSpot gave the game a 7.8/10, stating that it has much more replay value than the previous game, and that the minigames are much less annoying. IGN rated the game 7.9/10 (the same score they gave the first game), saying that while the game had more content, and it "sticks with the same winning formula...there really isn't enough new here to warrant another purchase." 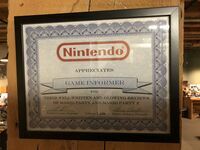 Nintendo of America sent the gaming magazine Game Informer a sarcastic certificate over the publication's negative review of Mario Party 2 and its predecessor. N64 Corbie Dillard, Nintendo Life 8/10 "There's just something about the simple fun of Mario Party 2 that makes it so difficult to put down at times. Sure the mini-games can be a tad on the basic side, but it works quite well in giving the game a more accessible gaming experience that should appeal to gamers of all ages and skill levels. The game tends to be a bit bland as a single-player experience, but if you can round up some additional players, and in truth that's what this game is all about anyway, you're likely to get far more out of the game and find it to be a nice diversion from the usual platforming fare normally associated with this cast of characters." N64 Joe Fielder, GameSpot 7.8/10 "There is a host of minor improvements as well, such as your ability to buy items during gameplay, the addition of duel bouts between two or more players who've landed on the same space, and the fact that you can now overcome some of the more cryptic instructions for the minigames by entering into a practice round before you play the actual game. You can even turn off the bonuses at the end of the game if you find them to be too cheap. Graphically speaking, both the stages and the minigames appear a little sharper and more stylized than before, while the soundtrack is at least on par with the original game's, if not an improvement over it. The greatest betterment is that since you won't get sick of the minigames as you did with the original, there's much more replay value in Mario Party 2, and replay value is the main point of the game. It's a great deal of fun to play with a few friends, even more so than the last." 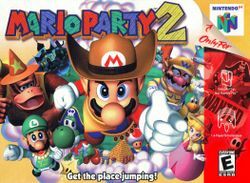 Mario Party 2 is the 20th best selling game for the Nintendo 64, having sold 2.5 million copies worldwide: 1.27 million in North America, 1.07 million in Japan, and 160,000 elsewhere, as of December 31, 2009. 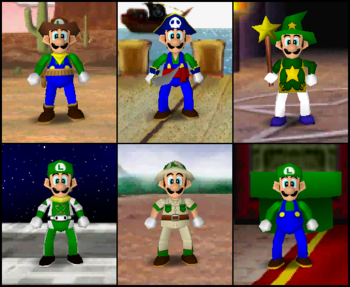 Despite this piece of official artwork showing all the characters wearing an outfit for a specific board during minigames, characters only wear their regular outfits in all mini-games, except Duel mini-games. When choosing Bowser Land, when selecting 2 players, it will say "3 Computer Characters" instead of 2. Mario Party 2 is the first Mario game to be officially translated to Spanish and Italian. Luigi and Yoshi, usually green and blue respectively, often switch colors, such as in Bumper Balls. 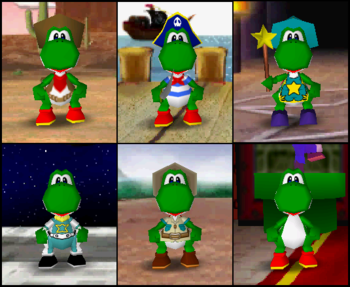 In later games, Luigi was assigned blue and Yoshi green, until character-specific color coding was dropped entirely in Mario Party 7. This page was last edited on April 7, 2019, at 11:16.